• establishes safe zones at schools, medical facilities and properties operated by the Illinois secretary of state, where federal immigration enforcement would not be admitted without a valid criminal warrant. The Act does not bar state and local police from conducting valid criminal investigations or serving criminal warrants, nor does it bar them from working with federal immigration agents to serve valid criminal warrants. The Trust Act takes effect immediately. 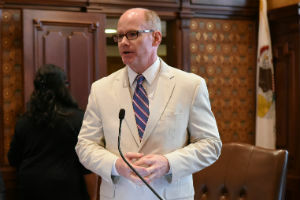 SPRINGFIELD – Senator Don Harmon (D-Oak Park) voted today in favor of legislation overhauling Illinois’ broken school funding formula and replacing it with an evidence-based model. The measure that passed in the Senate today on a 38-13 vote is based on Senate Bill 1, which passed both Houses in May and was vetoed by the governor in July. • No school districts would lose funding. • Funding would be distributed on a per-district basis, not a per-pupil basis. • Initial funding would be based on FY17 disbursement levels. It would increase from that point year over year as school districts get closer to reaching their adequacy targets. • The Chicago Public Schools block grant would be repealed, but CPS would be held harmless like every other school district so that it would not lose funding as a result of the change. • $350 million in new K-12 state funding for this schoolyear would be distributed to districts using a tier system that prioritizes districts farthest from adequacy. • School districts and their boards will have certainty each year about how much state funding they can expect to receive, which will make budgeting easier and more effective. The measure also includes a Republican-backed tax credit scholarship program that would award a 75-percent tax credit of up to $1 million to any taxpayer who contributes scholarship funding for students to attend private or parochial schools. Although Harmon opposes the tax credit, he said he strongly supports the measure as a much-needed change to Illinois’ school funding formula. 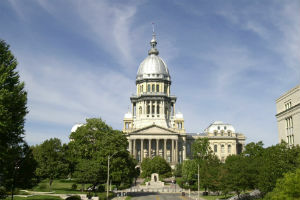 “In years to come, we will know that we voted for a transformational event in Illinois education policy,” Harmon said. Senate Bill 1947 passed both Houses and now awaits the governor’s signature. SPRINGFIELD – Legislation sponsored by Senator Don Harmon (D-Oak Park) that aims to eliminate lifetime barriers to employment for adults who committed crimes as youth was signed into law today. The measure makes it easier for people to have certain arrests sealed by a judge in Illinois, allowing them opportunities for jobs, housing and education that they might have been denied otherwise. The legislation does not immediately seal criminal records for every offender, but rather creates a process by which someone can go to court and request their records sealed. A judge will ultimately have discretion on whether or not to grant the request. Harmon worked closely with one individual who will benefit from the legislation – Quintin Williams, a 33-year-old doctorate student, husband and father who was recently denied a teaching position because the employer feared he would have a negative influence on students. Williams, a fourth-year Loyola University student earning his doctorate in sociology, is forever bound to a record for crimes he committed as a teenager and in his early 20s – crimes he regrets and for which he paid his debt to society. Since then, thanks in large part to his faith and to the countless people who saw potential in him along the way, Williams has dedicated himself to his work, his studies and his family. He’s stayed out of trouble, worked several jobs, earned college degrees and participated in anti-violence efforts. The National Employment Law Project estimates, using U.S. Department of Justice statistics, that 42 percent of Illinois adults have a criminal record, whether it’s an arrest or some other brush with the law. Rep. Camille Lilly (D-Chicago) sponsored the legislation in the House. It is an initiative of The Restoring Rights and Opportunities Coalition of Illinois, which includes the Heartland Alliance, Cabrini Green Legal Aid, the Community Renewal Society, the Chicago Coalition for the Homeless, and the FORCE Project (Fighting to Overcome Records and Create Equality). House Bill 2373 becomes effective immediately. “It is vital that we stand in total opposition to the hatred, bigotry and violence displayed by the white nationalist and neo-Nazi groups in Charlottesville this past weekend. They are the heirs to the Ku Klux Klan and the Nazis. We fought two bloody wars in opposition to their ideologies. We must continue to fight those same twisted ideologies today. “I voted today to uphold Senate Bill 1, a tested, evidence-based plan that will fix our state’s broken education funding formula, not temporarily patch it. The governor’s plan is short-sighted. It may promise low-income districts money in the short term, but it hides provisions that would gravely injure them in the long run, like tying funding to enrollment and counting TIF district wealth as property value.